Happy holidays everyone! Did you know that the Christmas season is one one of my favorite holidays? When I was young, it was mostly for the gifts (of course! ), but as I’ve gotten older I mostly look forward to the time I get to spend with my close friends and family. My in-laws are actually here right now, visiting all the way from France! 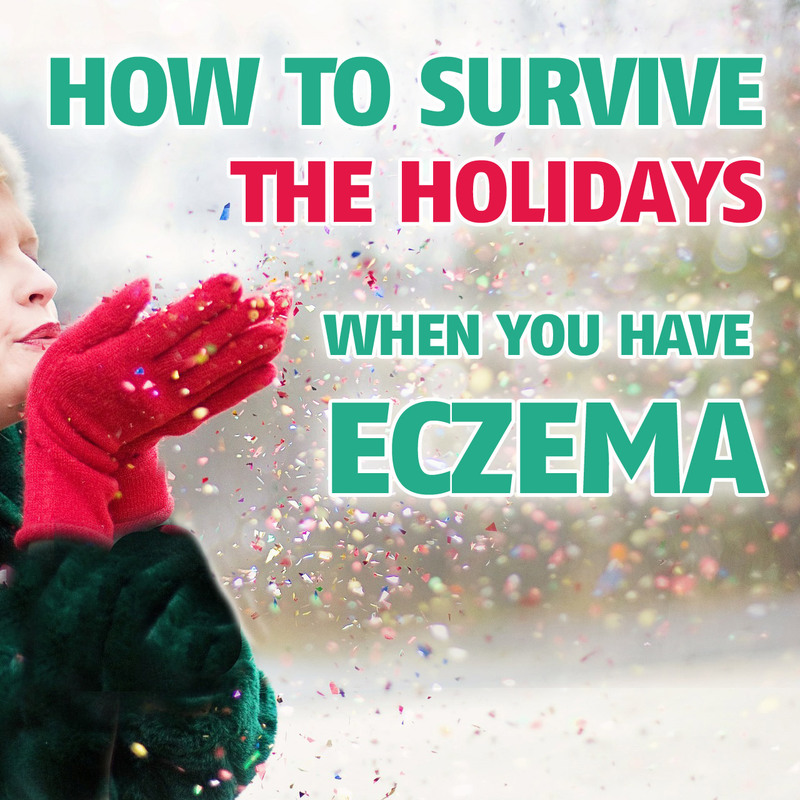 Below you’ll find a full list of eczema triggers to be careful for during this holiday season. I’ve also written an easy “actionable” under each one to help you know what to do when you come in contact with these triggers. If you find yourself breaking out with any of these triggers, follow the action to help you know what to do. “Oh Christmas tree, oh Christmas tree…” — It’s the center piece of every holiday household, but if you’re getting itchy, be careful of gathering under for too long! Fir trees carry traces of pollen, mold, and sap that can trigger itchy skin flare-ups. You especially want to watch out for the tree needles! Fir trees needles contains a sap called terpene– a kind of oil that irritates the skin and mucous membranes. Ouch! Artificial trees can also be problematic, because of dust build-up. The American College of Allergy, Asthma and Immunology (ACAAI) caution artificial Christmas trees as an allergy trigger — especially if they’ve been sitting in the attic for a year collecting dust and mold. Real trees: Don’t get scared off the tree just yet, you can still take your pictures, promise! However, if you want to avoid breaking out, you do have to make sure it’s free of any pollen, or loose pine tree needles (containing sap) before bringing it into your house. 1) Using gloves to protect you from the sap, simply douse the tree with a hose removing all pollen and excess sap. 2) Allow it to completely dry (you can use a leaf blower), and then shake off any loose parts. If you’re really sensitive, you can use an allergen-free cleanser. 3) In the house, place the tree where it won’t be touched or brushed by your sensitive skin. If you’re also the designated Christmas tree decorator (it’s my favorite part!) you can avoid breaking out by wearing gloves, long sleeves, and protective clothing. Artificial trees: If the idea of washing, drying and cleaning a real tree is too much, you’ll be better off with an allergen-free artificial tree instead. Just make sure to properly dust and vacuum it before placing it in the house, and avoid skin contact as much as possible. Sipping hot drinks around a cozy warm fire may seem harmless, but if you have sensitive skin, you might have noticed that your skin gets itchy when you stay for too long. One reason is that the smoke from fireplaces or wood-burning stoves create harsh dry air that aggravates eczema symptoms. It can also make your skin dry, leading to itchy flaky skin. If you find yourself sneezing or itchy when you’re around the fireplace, you may be reacting to the heat or dust! To avoid breaking out, distance yourself from the fireplaces or wood-burning stoves as much as possible to avoid your skin drying out or ash/dust mites on your skin. When you do have to stay near a fireplace or heater, you can minimize your risk of an eczema breakout, by properly moisturising your skin to prevent it drying out and flaking. I recently did an Instagram post on my favorite moisturizer, African Shea butter. I love it because it’s thick and stays on your skin for a long time, even under heavy clothing! I bought it online, on Amazon, here. It’s my go-to for winter! Christmas is probably the one time of the year that you get the chance to see your friends and relatives — and of course everyone wants to look their best! But did you know that eczema breakouts can be triggered by fragrances and jewellery? 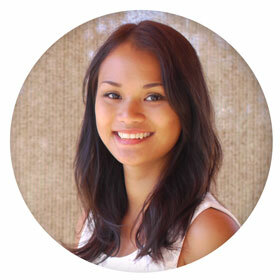 Ever since I cleared my eczema, I’ve tried hard to create a chemical-free, eczema-free haven. If you’ve seen any of my pictures, you’ll probably notice that I don’t wear jewellery — and that’s because I learned the hard way that most metals make me break out! According to the journal of Clinical and Aesthetic Dermatology, fragrances and jewellery are among the MAIN culprits of allergic contact dermatitis and eczema. If you have sensitive skin, or are prone to irritant contact dermatitis (eczema), try to avoid fragrances and jewellery, as much as possible. Especially nickel, brass, or faux fur/leather. If you have a young child that’s sensitive to perfumes, parabens and fabrics, having them well-wrapped in allergy-free clothes/blankets before passing them around can help to reduce the skin-to-chemical contact. In another post we talked about winter eczema, and how low humidity is common around holiday season. This is one reason why many people experience intense dry skin and the dreaded “winter eczema”.Low humidity levels strip your skin of its natural moisture, creating a harsh environment for eczema and dry skin. The best way to combat low humidity levels is with a humidifier. At night, when the weather is really dry, I use a humidifier to help me sleep — otherwise my skin can get really itchy! A humidifier puts more humidity into the air, helping your skin to retain its natural moisture and water. By keeping your skin naturally moisturized with the help of a humidifier, you can reduce dry skin build-up and potential eczema breakouts. If you find yourself breaking out with the dry weather, use a humidifier. (This is the one I use) The recommended humidity levels are found between 45-55 percent, but you can adjust to what’s most comfortable ( I usually stay at 50%). You can also add a drop of essential oil, to make your room smell like a spa! Super relaxing. Air freshener sales ramp up during holiday season, as it’s normal to want to freshen up the house before accepting well-wishers. However most air fresheners/deodorizers contain toxins that can aggravate symptoms of eczema, especially in children. Air fresheners contain volatile organic compounds (VOCs), that mask the bad odor and smells, rather than removing them. 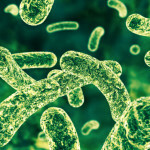 VOCs found in air fresheners include chemical compounds such as formaldehyde (the national toxicology program described formaldehyde as a “human carcinogen”), limonene ( a strong chemical used for removing oil), acetone (used to remove paint or nail polish), alcohols, esters, and petroleum. In small amounts these chemicals could be fine for the average person, but a recent study found that most plug-in deodorizers have above the recommended limit! In fact, about 1/3 of the deodorizers were found to be hazardous or toxic. Air fresheners also contain high traces of alkaline and fragrances: known irritants for eczema. Air fresheners can be extremely hurtful to your skin, especially if you inhale them for a long time indoors. Try to avoid spraying air fresheners in the house if possible, to avoid allergic skin reactions. If you really need to use an air freshener, buy an eco-friendly/carcinogen-free one instead, or (what I do), you can also use your humidifier to get rid of bad odours. Simple add a drop of essential oil or whatever scent you enjoy! While alcohol in moderation can be okay and even fine for most people, if you’re not giving your liver time to properly detoxify, it can put stress on your body, affecting your eczema or the healing process. Alcohol also creates glycation, which makes your skin more dry and itchy. Excess consumption can also block proper absorption of Vitamin C (an essential vitamin needed for your gut and skin), and can dehydrate the body if you aren’t drinking adequate water. I don’t drink often, but when I do I’ve set a few rules in place, that helps me not break out or get itchy. 1) Give your liver time to detoxify. This might mean not drinking the next day, if you drank a lot the day before. I usually do a “detox” day if I’ve been drinking a lot the night before, where I stay away from any kind of alcohol, sugar, (sugar consumption also affects the liver), and I drink a ton of lemon water to flush out any toxins. 2) Get your Vitamin-C. Excess alcohol consumption can also block proper absorption of Vitamin C (an essential vitamin needed for your immune system and skin). If I’m drinking I supplement with Vitamin-C. It also helps with a hangover! 3) Keep an even ratio. Alcohol dehydrates the body, which can make your skin itchy and dry. Follow the golden drinking rule: keep a 1 to 1 ratio. 1 glass of alcohol = 1 glass of water! For more information on alcohol and eczema, see my post on how to drink alcohol with eczema. And finally… my #1 secret to not breaking out? 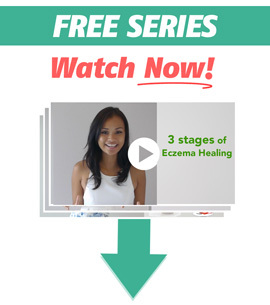 Food affects your eczema: for better and worse. That’s why I started this website! If you eat a lot of sugary foods, or eat a lot of eczema triggers like gluten and dairy, then no matter what cream you’re using on your skin, you will most likely have a break-out. You may have even noticed this yourself, if your eczema flared up after eating a specific kind of food like pizza or cookies. One question I get asked a lot from people following my program, is how I manage to stay away from eczema triggers during the holidays, when it seems like they are just everywhere. 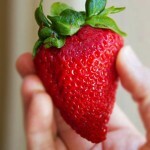 Did you ever notice that eczema triggers (like sugar, gluten, and dairy) are usually concentrated in the dessert portion? You can almost always get away with eating turkey and potatoes, or stick to the meat and veggies section of the main course — but when dessert comes out, it’s hard to run away or say no! For most people, that’s usually when the eczema breakout happens; after the ice cream or chocolate cake. Unless, you’re the one who brought the dessert — trigger free and delicious, of course! Here are several of my favorite desserts that I bring during the holidays: Delicious desserts for sensitive skin! They’re all gluten-free, dairy-free, and you can adapt the sugar preference to your liking! If you’re running short on time, you can still find dairy/gluten-free desserts in the supermarket. Sorbet, for example, is naturally gluten and dairy-free, and you can find it in most ice cream sections of the supermarkets. Or, look for desserts without flour, like flourless chocolate cake/tarts. This way, you don’t have to worry about breaking out, because you’re in control of your food! Well I really hope this holiday guide helps you to avoid breakouts during this season! If you find yourself breaking out, don’t fret. Look through this list to help you identify the trigger, and follow the tips above to help you you know what to do! If you are going to try any of the tips above, please let me know in the comments below. I always love hearing from you. Wishing you a merry Christmas, and a happy new year to come! Wish you a Merry Christmas and a happy new year to come. I just recently came across your Instagram and got inspired by your program. I’ve had eczema since I was a baby and have figure out ways to keep it at bay, but this Winter season in particular has been really tough on my face and neck. I was wondering if you had any suggestions on what products I can use or anything that has worked for you. Thank you!! Hi Erin! During winter I use African Shea butter (if you search African Shea butter eczema), you can find my post about it. If you follow me on Instagram, I think I also posted a picture of the one I use there, Molivera Organics. It’s my go-to for winter!